Welcome to the Russian River country. 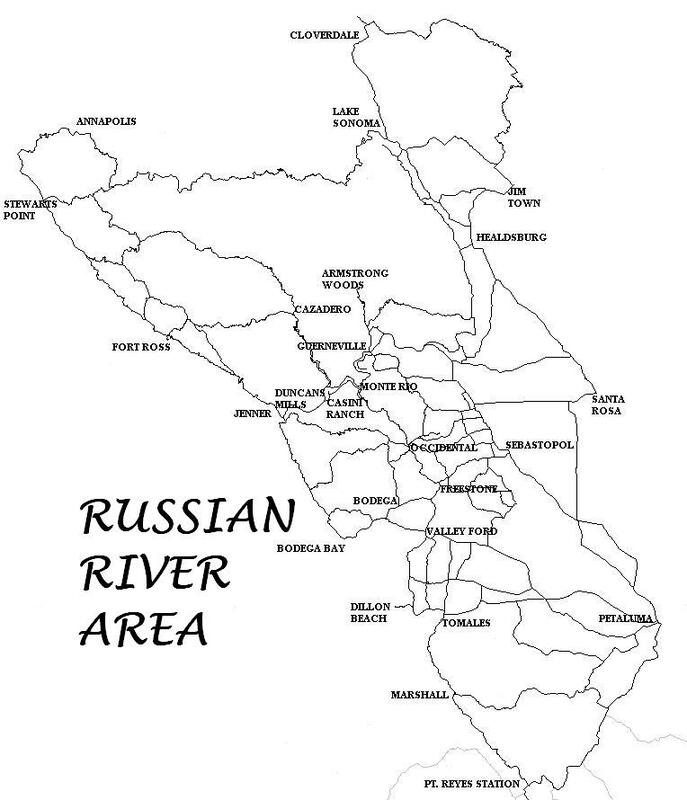 The river is named for the Russians who settled the area in 1812 as traders and sea otter hunters. They decimated the otters and withdrew in 1841. During the next 60 years the river and terrain kept the area isolated. The stage coach road, Fort Ross Road, from Healdsburg to Fort Ross, was routinely washed out by 120″ rains during the winter, and the Russian River flooded regularly. It still does despite modern dams. At the turn of the century, the redwoods brought railroads. The railroads in turn brought tourists. 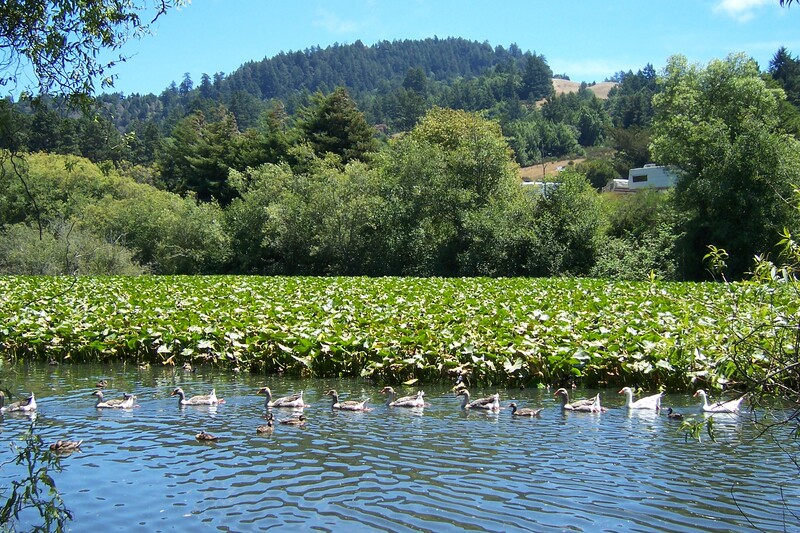 By the mid 1920’s, San Francisco’s resort of choice was the Russian River area. After the depression, wealthier San Franciscans went to Tahoe, and by the mid 1970s, the Russian River was in a deep depression. Most resorts were dilapidated. the 1980’s the gay population of San Francisco found the Russian River area and revitalized it. This brought challenges and changes to the area. In the 90’s, diverse accommodations at a variety of prices and varied segments of the population are the norm. Cycling enthusiasts should be able to find everything they want here. The Pacific Ocean dominates the climate of the Russian River area, and it is easy to pick the weather you want by moving up and down the river. Generally, the coast is foggy and cool in the mornings and late afternoon. Healdsburg, a major inland city, is usually fog free and 20 degrees warmer. If you want to sunbathe at 10AM, you need to head inland towards Healdsburg. If you’d like to swim at 4 PM, it may be a little too cool at Duncan Mills, but 5 miles to the east, in Guerneville, you can still get a sunburn. The coast also affects the winds. In the morning, the winds come in from the coast. By l0AM they’ve usually died down. By 2PM they have started up again. Plan your riding around the wind. Winds are the strongest in the afternoon where the sun is still strong with no fog. They’re less powerful after the fog has rolled in. So, if you’re pooped, stop and shop in a little town and wait for the wisps of fog, and then start riding. You’ll encounter less wind. Because camping space is limited, you need to be on the confirmed list of members to camp in the ACTC camping area. The campsites available this year for camping are 109,109B and 110. This is only for use with tents. If you have a RV you need to make your own arrangements for a site. If there is not enough room in these areas, any overflow will need to camp in the overflow area behind the store. These are different sites than last year, click this link for the campground map Campground Map or please see map at www.casiniranch.com. One thing we ask in regards to camping is that; No one parks their car in the middle of the campsites. This will leave more area for tent set up. The new management of Casini Family Ranch requires that each car check in at the gate and provide names of all people in the party and the vehicle license number. Once checked in you will receive a parking pass that must be displayed in the vehicle while parked at the campsite. This will prevent cars from being towed. Camping for ACTC will be available on Friday at 12 noon. Anyone planning on arriving before this time must make his or her own camping arrangements. You need to be out of the camping area by noon on Sunday. Cell phone coverage is very limited in the campground. For some carriers you will not get coverage. There is free WiFi in some areas of the campground but may not be where ACTC is camping. Many people will arrive on Friday evening. This year we will be having a group dinner. However, we encourage you to bring a cooler with your beverages of choice, an appetizer for before the dinner and any other snacks and drinks you will need for the weekend. ACTC coolers will not be available for personal use. Saturday morning a continental breakfast will be served. There will be items if you wish to pack a lunch to carry on your ride. Saturday night we have a potluck BBQ in camp. Please bring meat to grill, and a nice dish to share with all. Charcoal will be provided by ACTC. Sunday morning, everyone is on their own for breakfast. Many people ride into Occidental or Duncan Mills before packing up to go home. The campsites need to be cleared by noon. We ask that all campers be prepared to lend a hand with the housekeeping and cooking as needed. It means a lot to have everyone pitch in! The Russian River area offers a mixed bag of terrain. The area to the south generally has rolling coast ranges. Higher ridges are shaded with redwoods while the lower ones are grasslands. To the north, redwoods dominate and the hills are steeper. To the east, a large valley stretches from Healdsburg to Santa Rosa. There you will find rolling hills, apple orchards, and vineyards. You can do your own ride, or join others for a ride, or choose to not ride at all. For 2009, John Blaine has posted a ride that leaves each day at 8:00 am after breakfast. If you do your own ride, please turn your statistics into Brian Chun, the event chair. This link is to a file of all the routes created by Don Axtel: RRR-routes . Please print out which routes you might be interested in and bring to the rally. To see the individual routes click here. For a list of the current ACTC billy goats in the area, click here. Some club members will be riding to and from the Russian River Rally. Please contact them directly if you are interested in joining. Howard and Bev Saling founded the rally in 1978. The first site was at a campground near the Korbel Winery. The following year it moved to Monte Rio. The year after that, it moved to Duncan Mills. The campground eventually became private, and the rally was moved to Casini Ranch until 1998 when it moved to the Faerie Ring Campground, and returned to Casini Ranch in 1999, its current home. In 1985, the first ACTC tour book was produced. Now days we put the information on the website instead of printing a tour book.